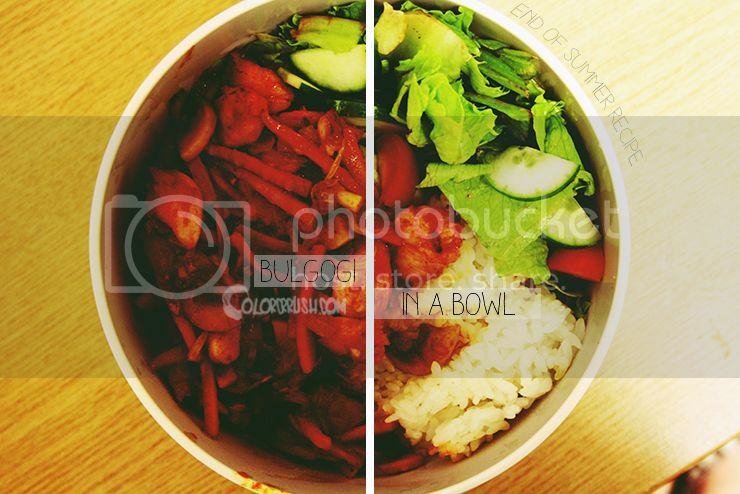 End of Summer Recipe: Bulgogi in a Bowl! did you sleep as well as I did? If not, I know a good way to cheer you up: home-made food! And even better: home-made Korean food! I love to cook and after moving countries forever I of course picked up a lot along the way. Most of my friends in Japan were actually not Japanese but Korean exchange students which is why I have a lot of friends now since I moved to Korea :) I personally think it's most of the times easier to be friends with Koreans than Japanese because they are much more direct and open. Although I lived in Japan for almost 2 years I don't really have very close Japanese friends - but I have at least 10 very good and close Korean friends! One thing my friends love as much as I do is cooking. I love how, in Korea, people are always gathering to enjoy some food together. I did a lot of cooking together with my Korean friends in Japan and everyone in my dorm is surprised that I can cook Korean. It's really not that hard if you learn the basics (which is: everything needs to be fried in sesame oil, use honey instead of sugar and get your hands on gochujang, Korean chili paste.) The rest is just doing what you'd usually do. So are you ready for a dish that is perfect for the end of summer? Refreshing and fiery at the same time, this is a treat when the seasons transfer from hot to chilly temperatures. Bulgogi is, hands down, my favorite dish of Korean cuisine. I like marinated beef and I love the mixture of a tad spicy and sweet. This Bulgogi in a bowl dish was created because I don't own any plates so I always eat out of that one bowl I brought from Japan. So in order to cut on dishwashing and time I squeezed the bulgogi meat, a fresh salad and rice together in a single bowl and voilà: created was a wonderful dish. It's at the same time hot & cold, spicy, salty and sweet. I love it. 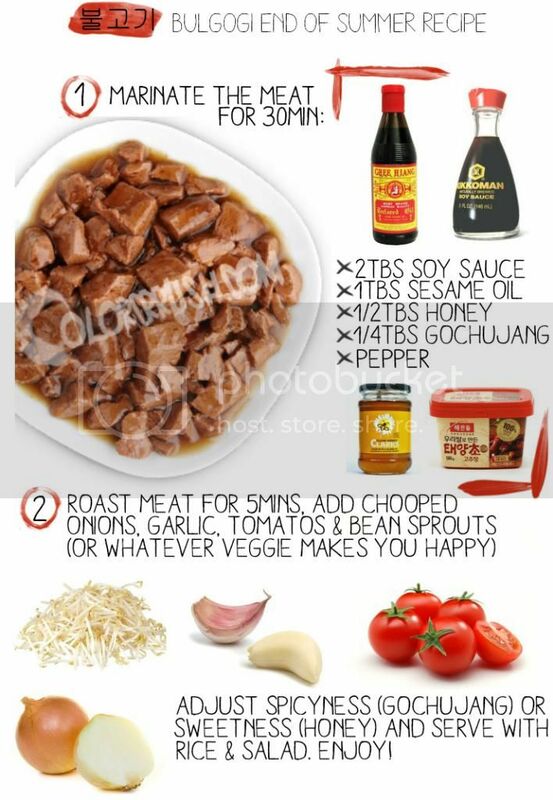 Oh I also love bulgogi because it is superduper easy to make yourself at home! You don't even need much fancy sauces. Sesame oil and soy sauce should be sold at every major supermarket now and gochujang in Asian corners or Asian markets of your local town. 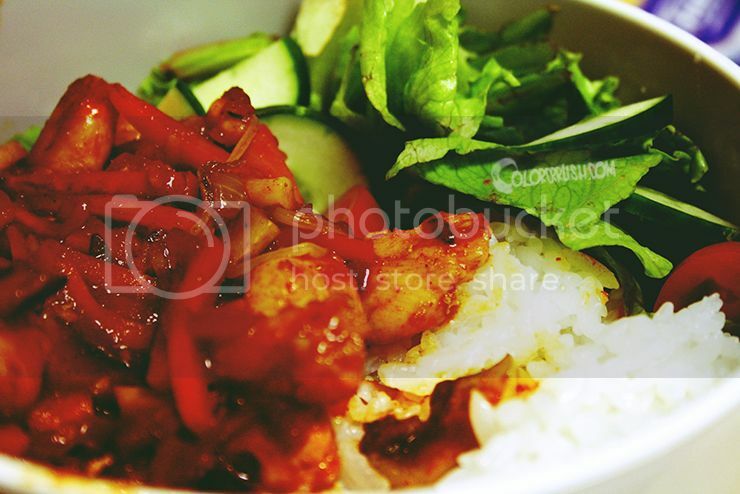 If you can't get your hands on the Korean chili paste don't worry: You can also use fresh chillies or even chili powder. As I said: superduper easy and also fast! You can (and I highly suggest that you do) marinate the meat longer than 30mins but you should let it sit at least for 20-30mins. If you don't, you risk your meat not adding all the flavors (most of the time I also add the chopped onions and marinate them together with the meat) and it can get stringy. This of course works also with tofu if you're vegetarian. And go crazy on the veggies! I always use what I have at hand: Tomatos, peppers, mushrooms...whatever you like. Pro tip: If you make a bigger batch, it refridgerates very well for 2-3 days. I also used the mixture for wraps and as a taco filling with some salad. Delicious! Korean food doesn't need to cost you an arm and a leg (such as in Berlin, where Korean food is the new Japanese cuisine and therefore super expensive!) and can save you some time too. If you want the full experience, put some kimchi on top of that!